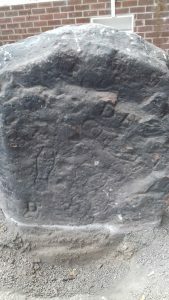 The Calderstones, currently to be found at Calderstones Park in the suburbs of Liverpool, are displayed like a stone circle; a collection of six sandstone Neolithic stones, marked with modern graffiti and much older carvings. They do indeed offer a mystery, as they were not part of a circle at all, and were most probably part of a Dolmen – a burial chamber. They have been moved a number of times which also presents problems for archaeologists and pre-historic scholars. The stones still however never fail to impress. They are housed – for now – in a glass house, and are due to be moved once again, but for now, they still offer a rare glimpse of a surviving example of stones that made-up a Neolithic burial chamber, and also present stones that can be examined close up. For further details on this modern discussion of the stones, see Herdman’s ‘A Contribution to the History of the Calderstones, near Liverpool’ (1896). When industrialist Joseph Need Walker acquired the estate in 1825, the stones became a gateway feature for his new grandiose estate. They were moved from the outside the park gates in 1954. The estate itself was sold to shipping magnate Charles MacIver in 1875, his sons selling it to the Liverpool Corporation in 1902. The stones will be re-examined during their next move and perhaps the mystery of the Calderstones will be solved. The Calderstones on display today, presented as a stone circle. A carved bird in the stones found by a school child a few years ago. The mark of the cross near another possible carving. 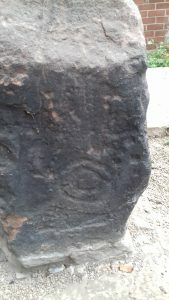 The carving of a spiral design. 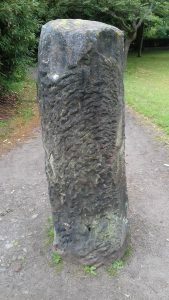 Similar carvings can be found on Neolithic stones in various parts of the UK. More modern day graffiti carved on the stones. The back of the Calderstones mansion, with a rather art-deco looking extension. A lodge house at Calderstones. Modern day graffiti and footprint carvings. You can see how the stones are set in a concrete base on this particular photo. Another view of a carved and rather weathered spiral design. 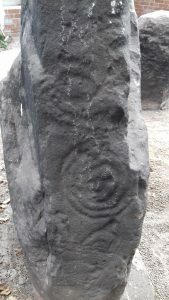 Yet another carved spiral as described by Professor Herdman. On the gateway there are four statues representing the four seasons, here is Autumn holding a sheaf of wheat and Winter, represented as an old woman in a shroud. The first of the four seasons; Spring and Summer. 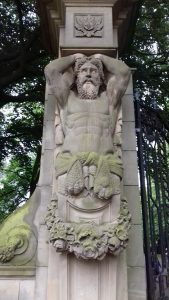 The God Atlantis in one of the gate posts, there are two and were both originally located on a building opposite the Town Hall that was demolished in 1928. They were then moved to their present location.